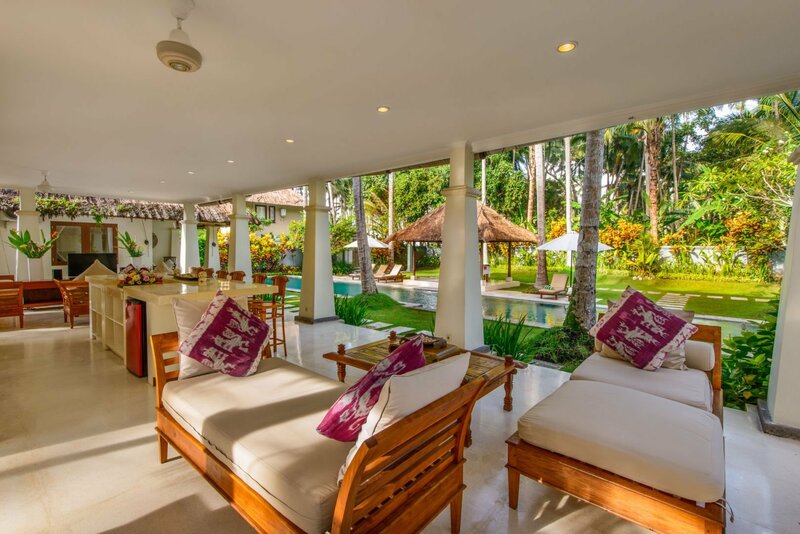 Villa Gils is a luxury 4 bedroom private Villa. 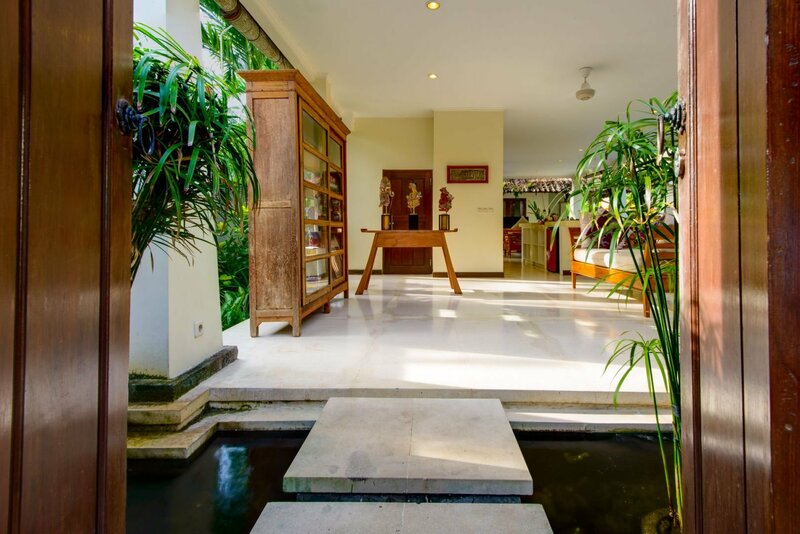 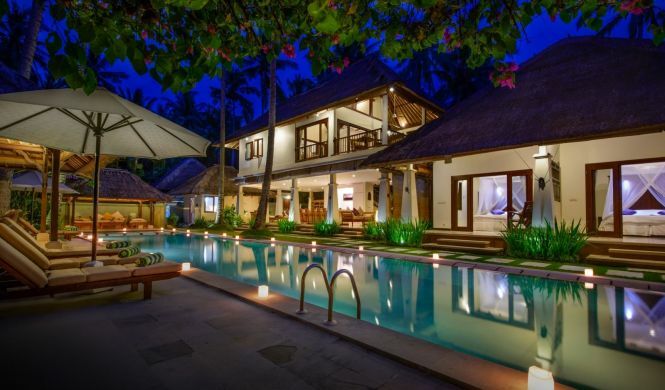 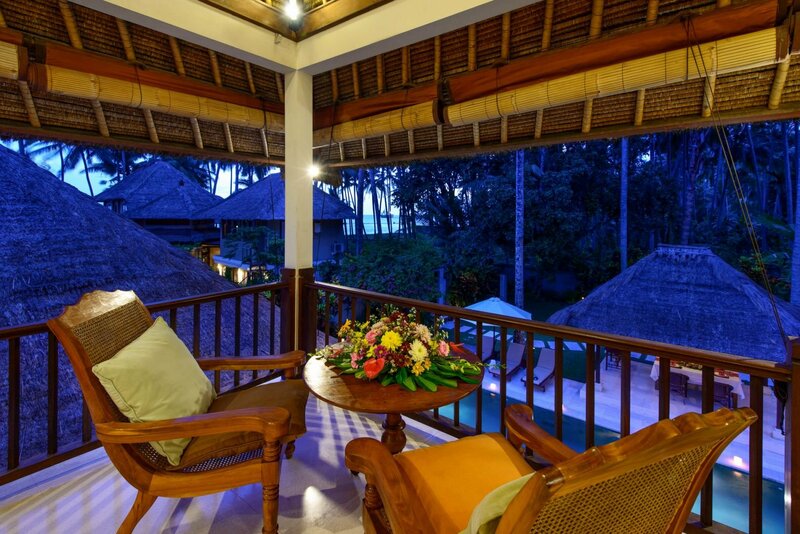 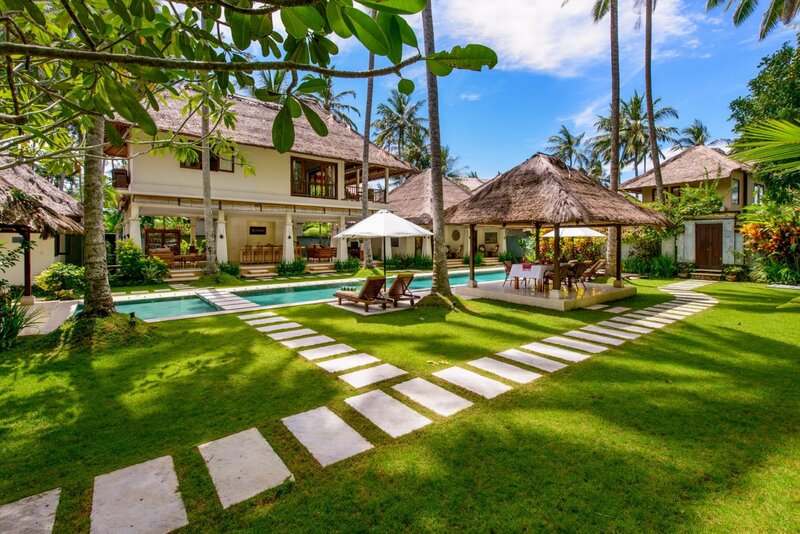 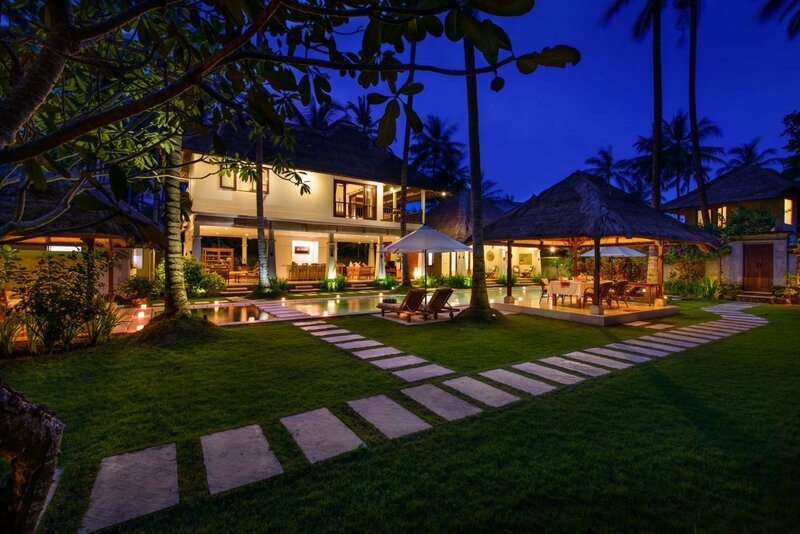 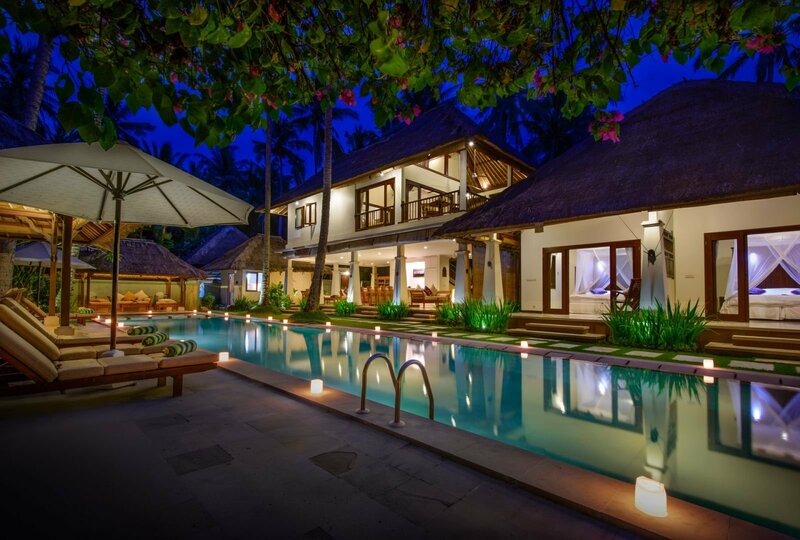 With a modern Balinese style that enchants all her guests, many returning year after year. 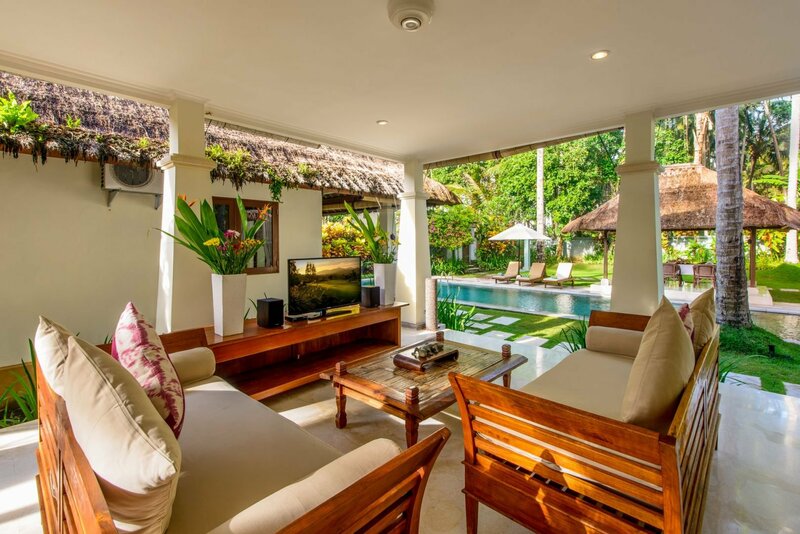 The villa has been designed and improved over the years to now be an ideal facility for the perfect holiday destination. 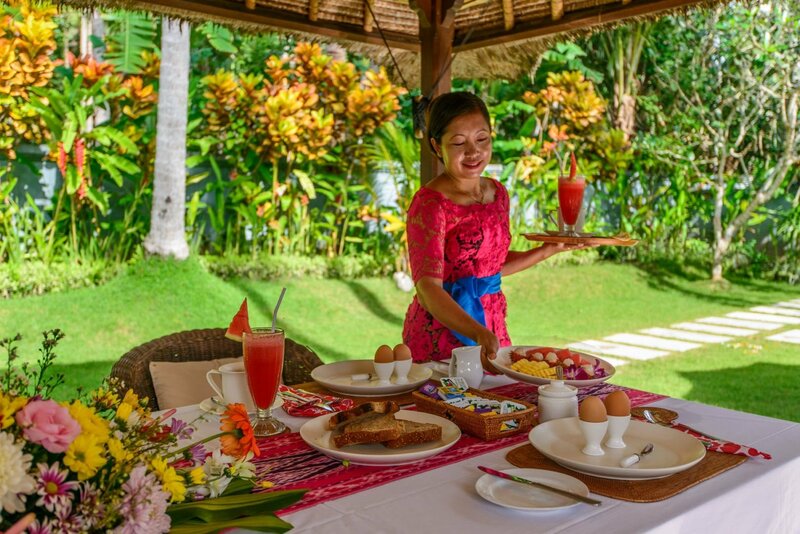 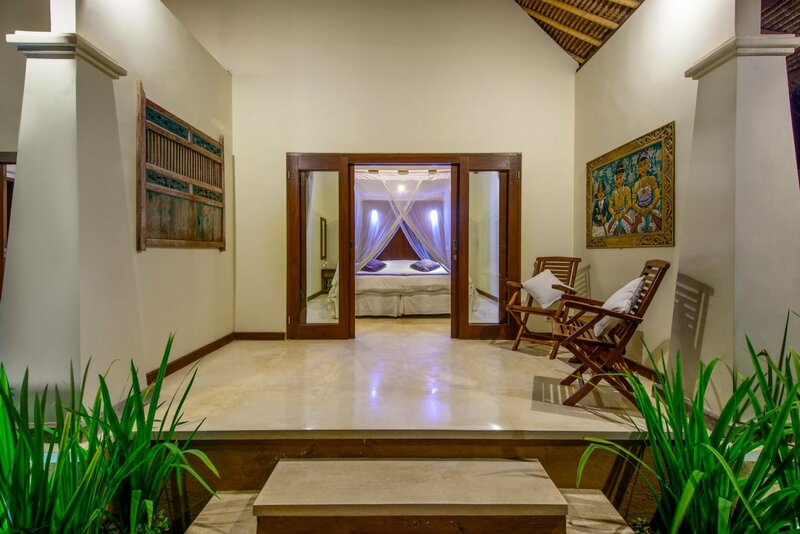 From the moment you enter the villa it will feel like home and your every need will be happily taken care of by the fantastic Villa Gils team. 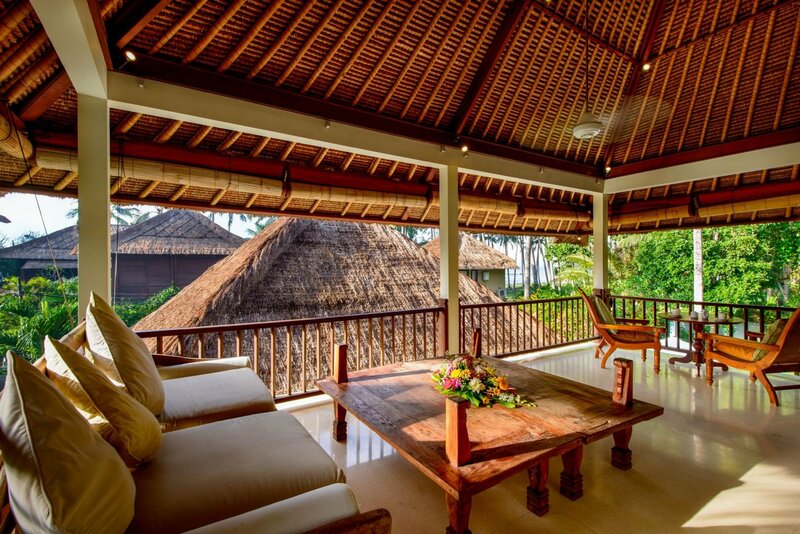 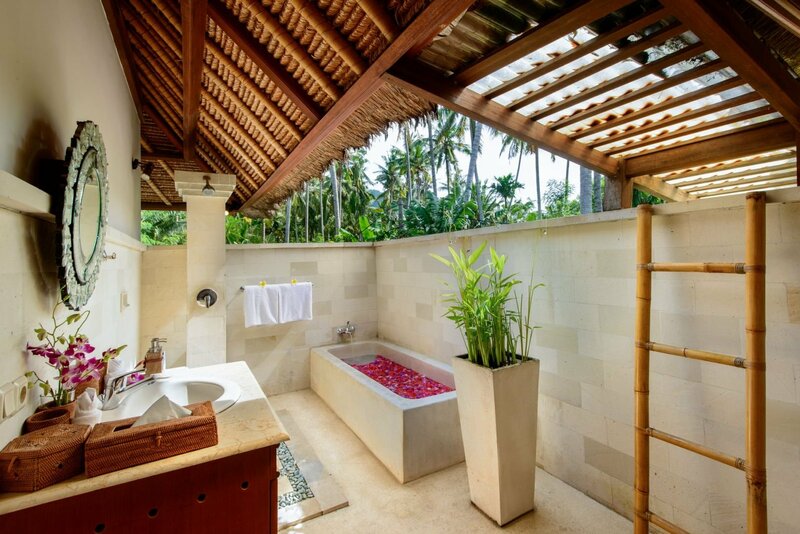 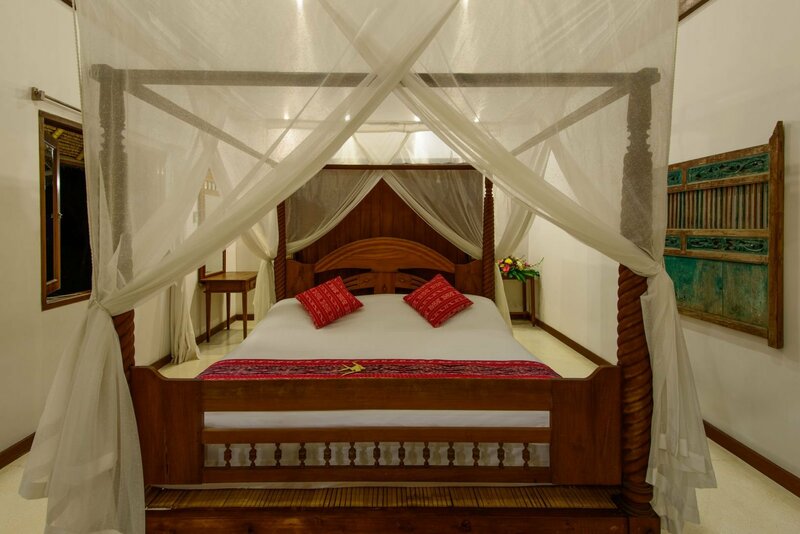 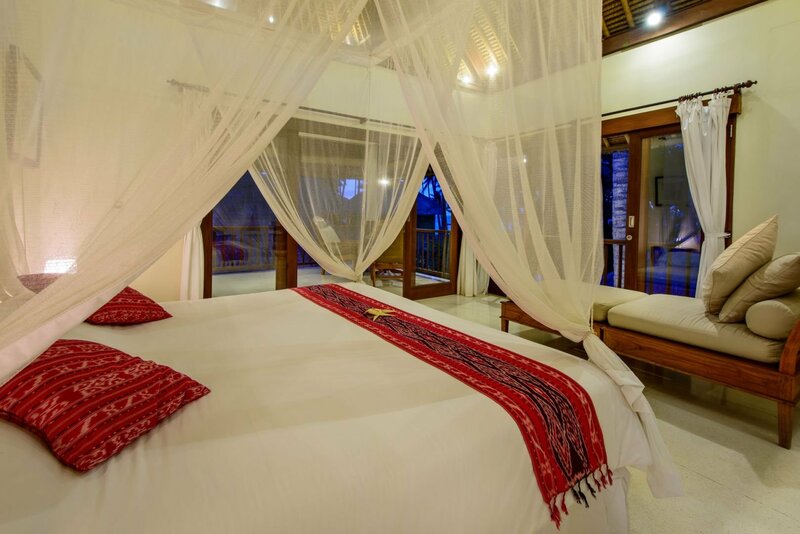 The Master Suite is on the second floor of the main bale under a stunning Alang Alang roof. 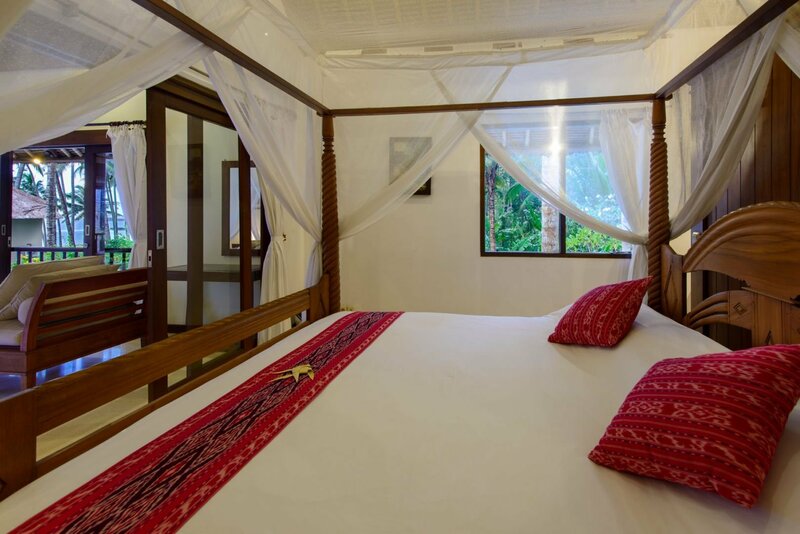 The bedroom is air-conditioned and features a luxurious king size four poster bed, accompanied by an ensuite bathroom with private outdoor shower facilities and has great views to the ocean. 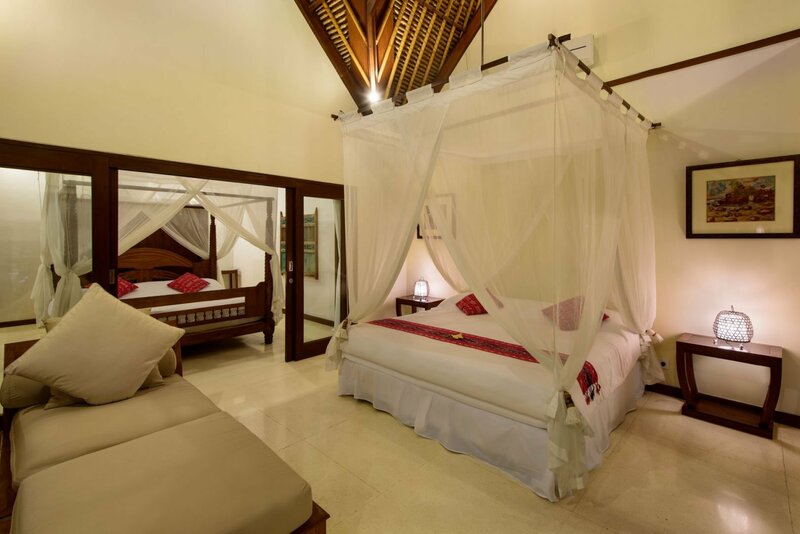 A second bedroom with its own private ensuite is also located on this level with the bedding able to be set as two single or one king configuration giving plenty of space for the family to spread out. 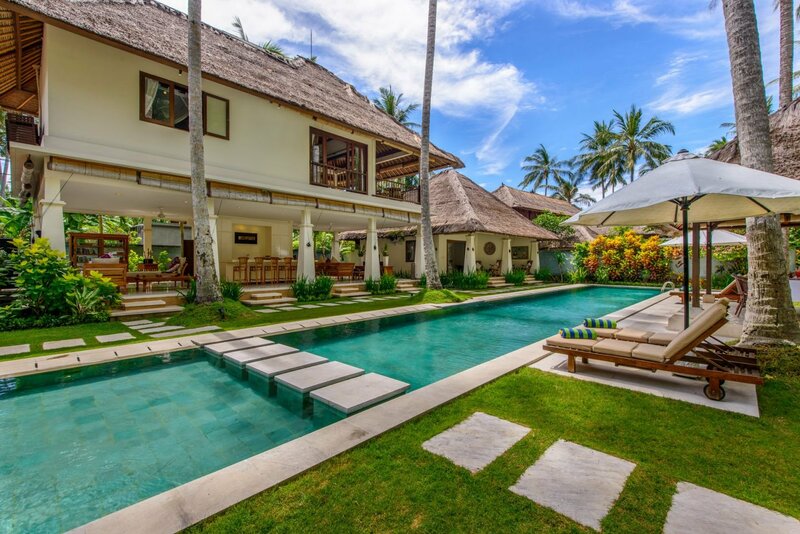 The remainder of the second floor is dedicated to a terrace overlooking the pool and gardens of the villa as well as the ocean and neighbouring coconut grove. 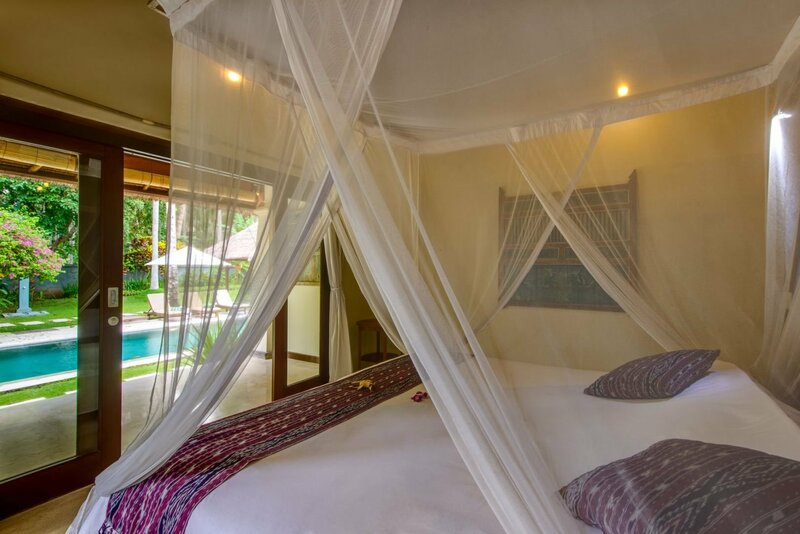 A fantastic spot to enjoy the early morning dawn or spend and afternoon relaxing on the comfortable day beds lulled by the gentle sea breezes and sound of breaking waves. 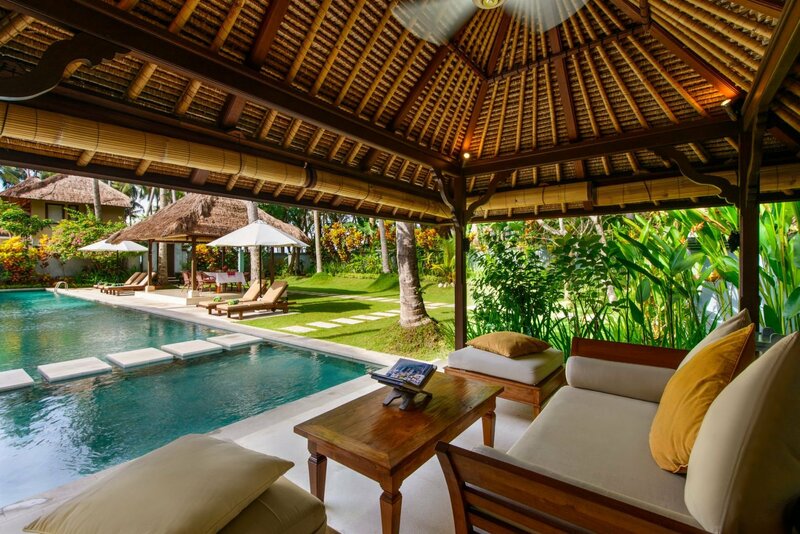 It is truly a special part of a fantastic villa. 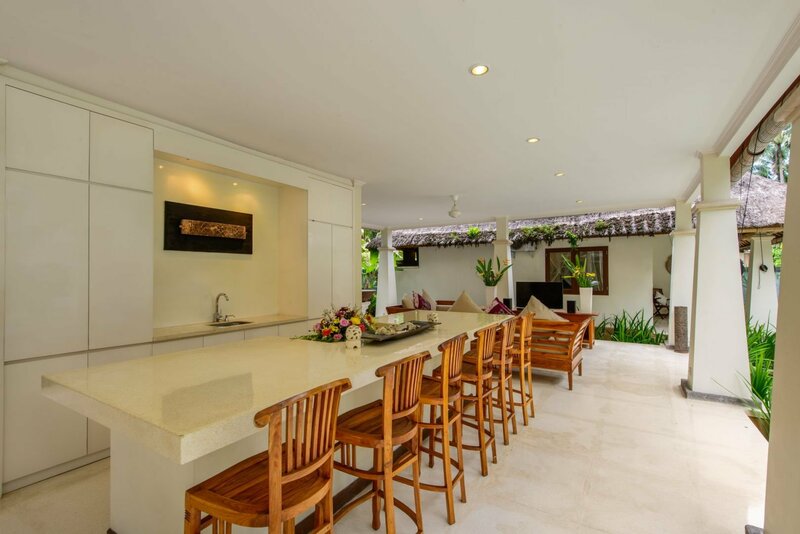 A cocktail bar stands at the heart of the expansive breezy open-plan living area. 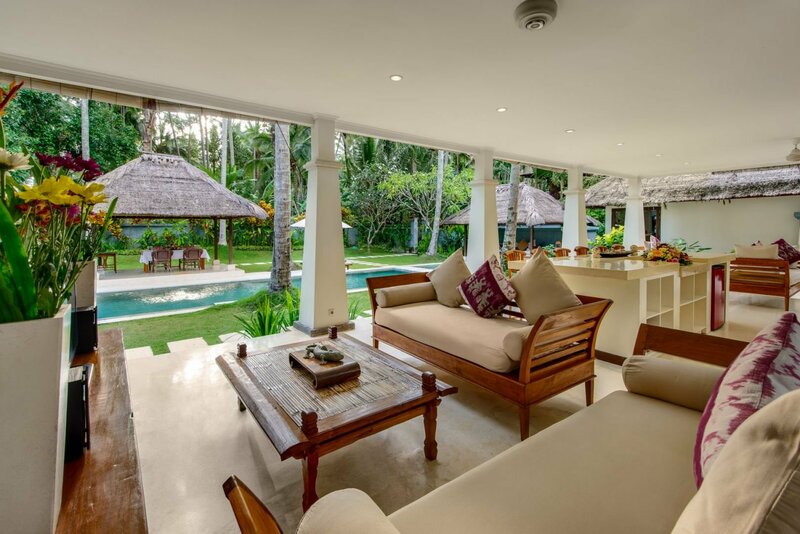 Enjoy an ice cold beer or your favourite cocktail as you plan the next day’s activities. 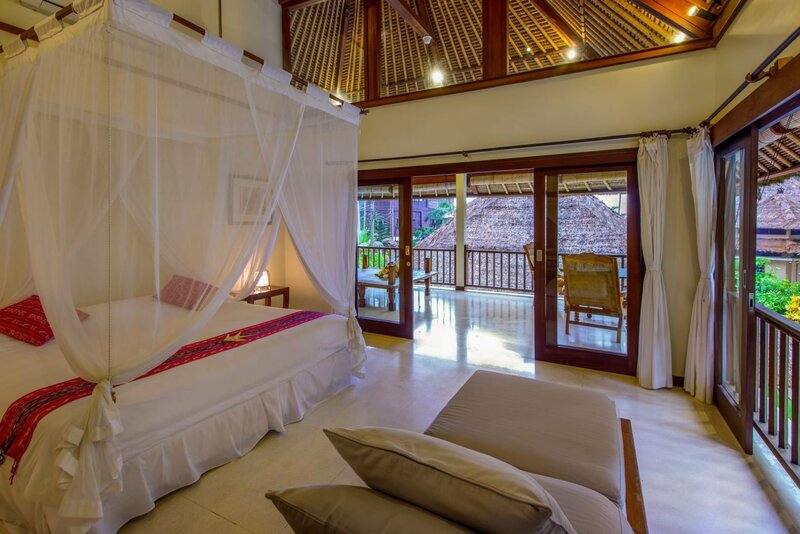 Then retire to the comforts of the day beds located at either end of the living room to relax. 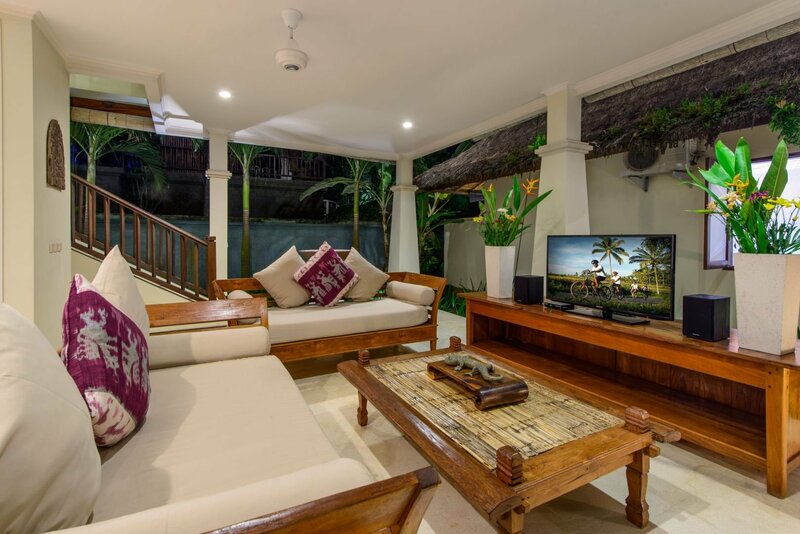 Read a book or play a board game by the water feature at one end; whilst the children watch a DVD at the other. 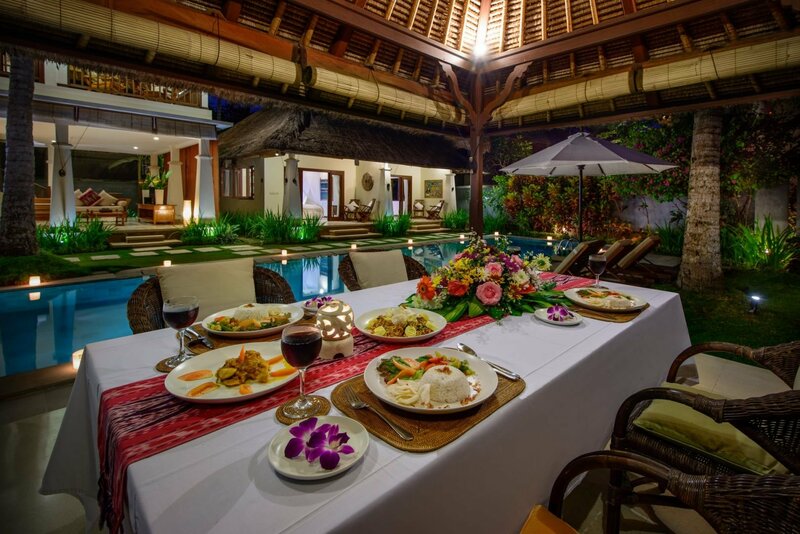 The Alfresco Dining Bale offers yet another inviting location for sharing meals, drinks and pleasant conversations. 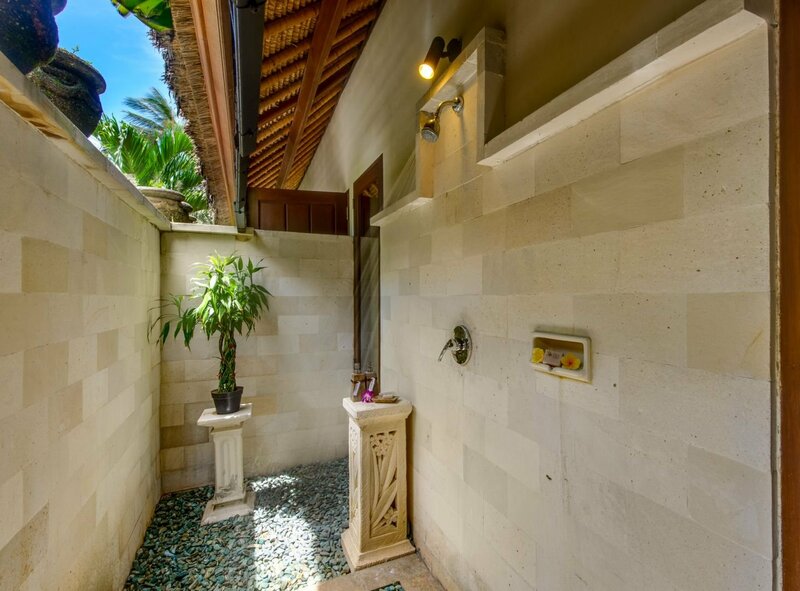 Located between the spacious garden and the pool, you can relax as your children play safely within sight. 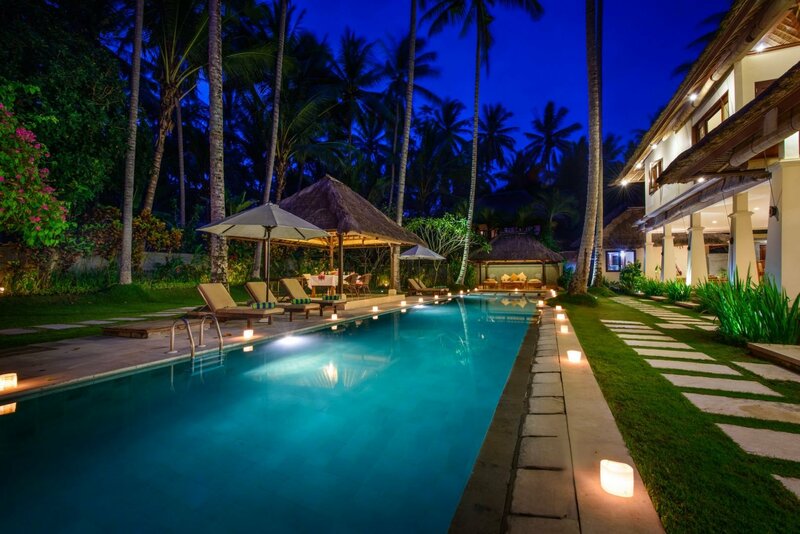 The stunning 25 metre lap pool beckons after a long day sightseeing. 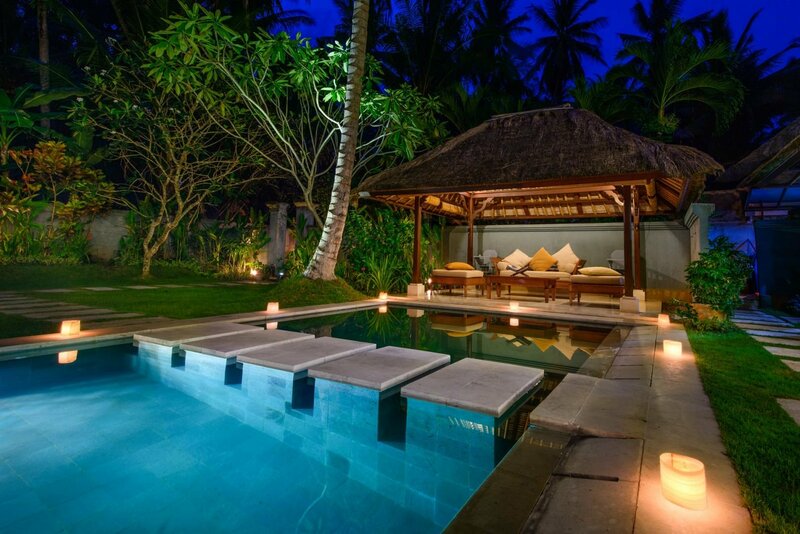 The small wading pool will keep your children entertained for hours. 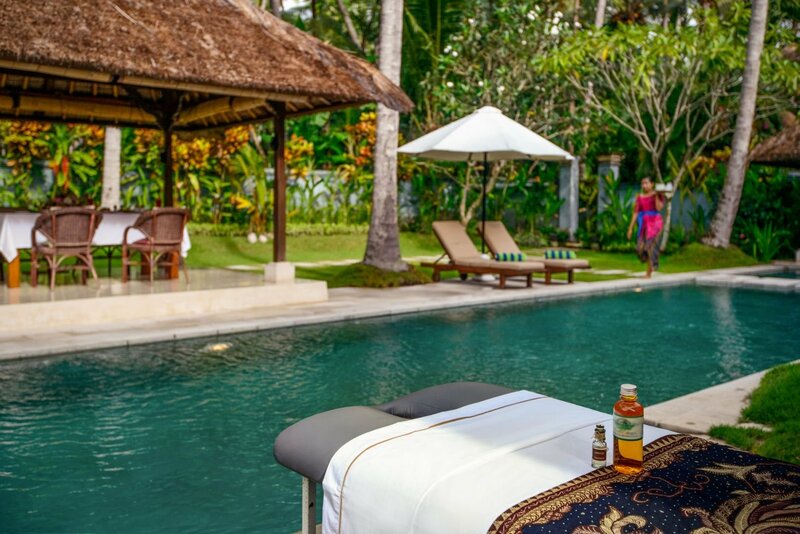 Be sure to stay long enough to allow a few days of complete rest and relaxation by the pool. 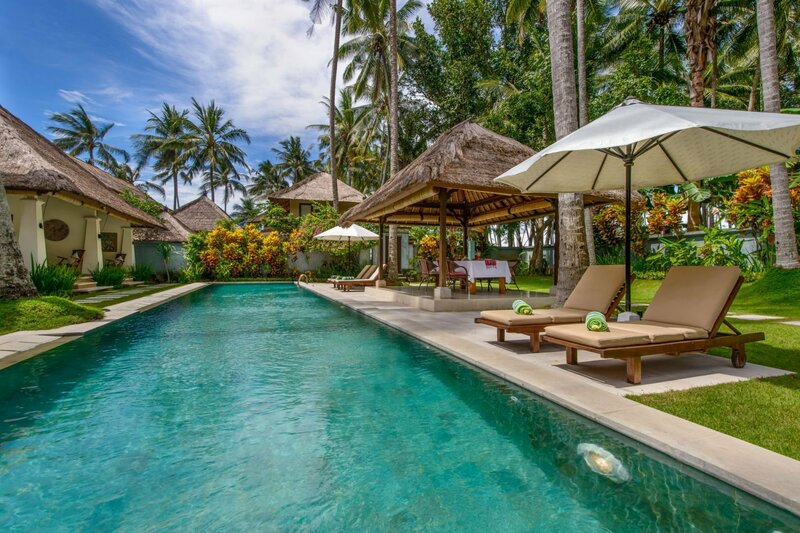 There are six sun lounges along the edge of the pool to cater for larger groups. 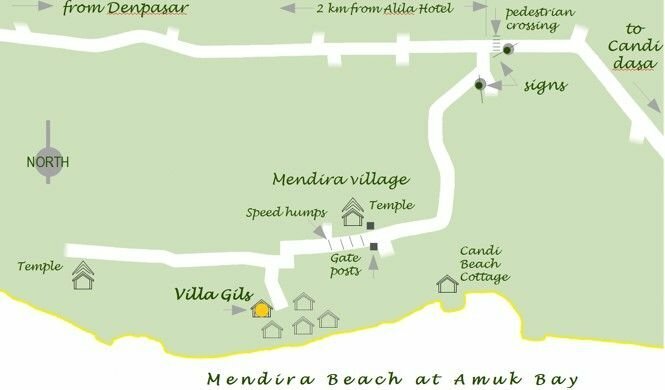 You may also like to practise your snorkelling in the pool before venturing out to see the amazing fish and corals just 50m from the Villa off Mendira Beach. 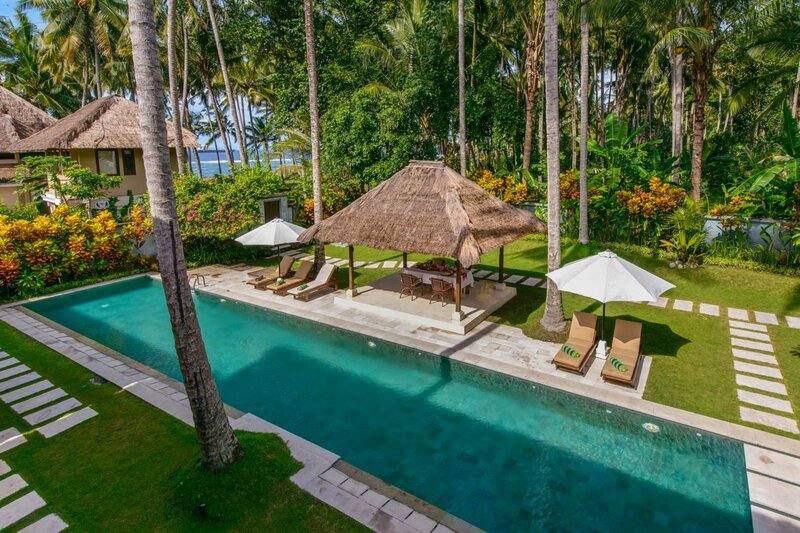 The ultimate relaxation space situated at one end of the pool, the Alang Alang roofed Daybed bale is the perfect place to lay back and relax with an ice cold beverage. 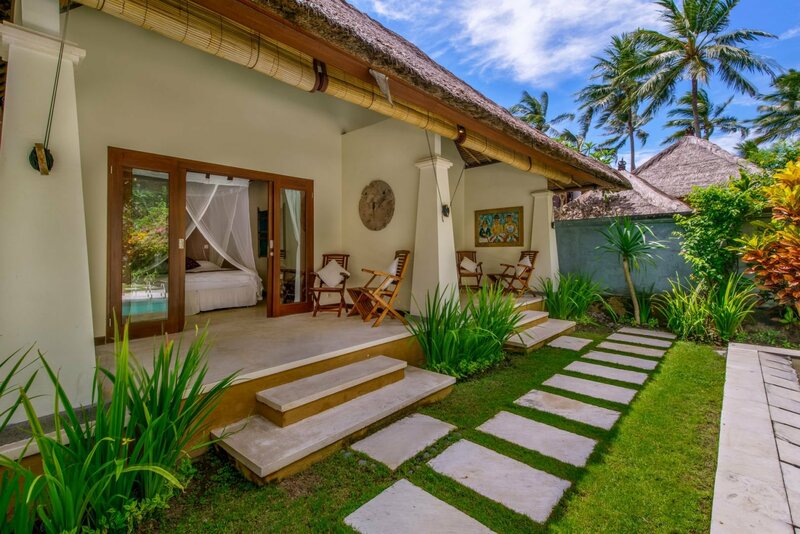 The Bale is nestled between the pool and the tropical gardens and is ideal for indulging in a Balinese massage, a good book or an afternoon nap.